Search.myway.com is the PUP that uses misleading techniques to prevent removal. Use Reimage to locate malicious components and get rid of them faster than with uninstall instructions. A full system scan blocks virus reappearance and prevents traffic to malicious domains. Search.myway.com is considered to be search engine which you can deliberately or accidentally download with another product. It belongs to Mindspark Interactive Network. Though the company is regarded as one of the major software developer on the market, its products often cause doubts. Even though this search engine is not considered to be technically a virus, certain characteristics and features raise concern over the reliability of this browsing tool. 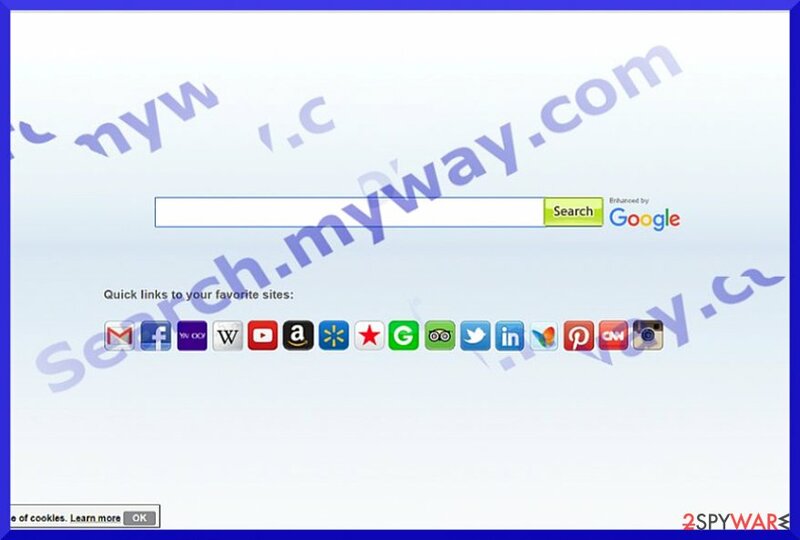 What is more, you may recall several other search engines or tool identical to this one: Hp.myway.com, My Way Search, My Way Email Search Engine, Pets by MyWay, Wallpaper by MyWay, etc. You will also discover that the same company promotes EasyDirectionsFinder Toolbar, QuickWeatherAlert Toolbar, etc. Search.myway.com might have settled on your PC system as an add-on to a recently installed weather app or another program. The most of them claim that they are capable of improving people's browsing experience and help them organize their work, save money or receive other benefits. However, if this search site gets an ability to change the start page, the new tab page, and the default search engine of the user, it will display ads and commercial deals during a browsing session. Thus, some users, who value their online privacy may be inclined to perform search.myway.com removal rather than keeping it. Reimage or Plumbytes Anti-MalwareMalwarebytes Malwarebytes does it for you faster. The major negative aspect of Myway virus is that it tracks your online activities with the help of multiple tracking cookies. Thus, your data may be used not only for “Software improving,” but for advertising purposes as well. As a result, more commercial ads may surface bothering you during your browsing sessions. In addition there is an identical browser engine – Hp.myway.com – available in the cyber space. It also shows similar design as its Search MyWay counterpart. However, neither of the search tools support security plug-ins which is a major flaw if you value cyber security. Furthermore, the search engine may display the same load of sponsored advertising content while you are watching a movie or reading news article. MyWay search engines are mostly promoted as the additional component to a specific toolbar. Whether you download a music or weather app, your search engine will be automatically replaced into hp.myway.com or search.myway.com browsing tools. Fortunately, you can prevent it from installing if you pay attention to the programs and their installation wizards before you click on the “Install” button. Choose “Custom” or “Advanced” option and deselect all shady optional programs, browser extensions, and toolbars. Besides, you may also find unknown toolbars and other add-ons on each of your web browser. You can delete them manually. 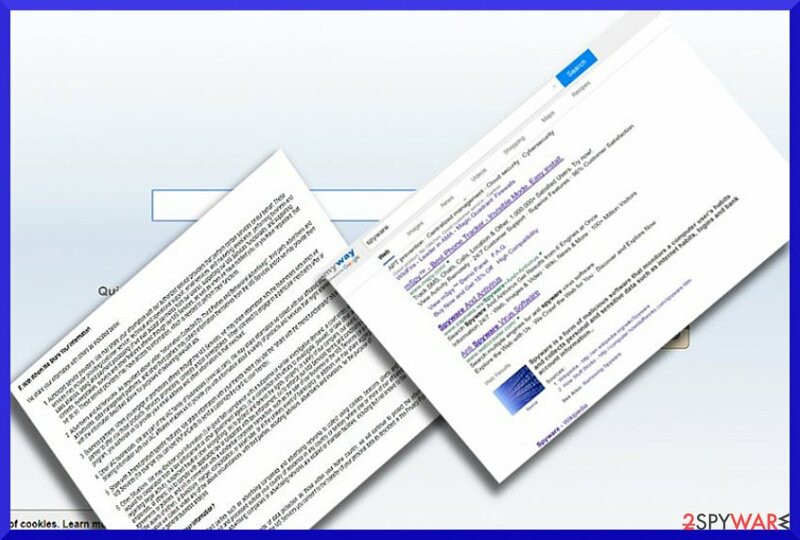 It is also possible to remove search.myway.com with the assistance of manual instructions. Recently, the developer of this program contacted us asking us to remove this post from 2-spyware.com website. We believe that we shouldn't do that as long as programs that we offer for the removal of Search.myway.com can detect it and help users to remove it from the system. As it is mentioned under each of download buttons, we ARE affiliated with these anti-malware programs, and while some of them are free, others can remove a virus only after purchasing them. These mentions fully fulfill each of the requirements of FTC. If any of your web browsers has been offering you Search MyWay. instead of your favorite search engine, you should not ignore such alert. It may suggest that one of Mindspark Interactive Network products has already found its way on the system. carefully investigate the list of system programs. You should not only remove Search.myway.com but eliminate its web scripts. The guide displayed below will instruct you howto do it. It will be of service if you decode to opt for manual Search.myway.com removal. If you have installed an app created by this company, you can uninstall it the usual way via the Control Panel. Though the search tool is available to everyone, occasionally, it targets more Italian netizens. Here, look for Search.myway.com or any other recently installed suspicious programs. Wait until you see Applications folder and look for Search.myway.com or any other suspicious programs on it. Now right click on every of such entries and select Move to Trash. When in the new window, check Delete personal settings and select Reset again to complete Search.myway.com removal. Once these steps are finished, Search.myway.com should be removed from your Microsoft Edge browser. Make sure you delete all elements associated with MyWay search tools. Here, select Search.myway.com and other questionable plugins. Click Remove to delete these entries. Now you will see Reset Firefox to its default state message with Reset Firefox button. Click this button for several times and complete Search.myway.com removal. Here, select Search.myway.com and other malicious plugins and select trash icon to delete these entries. Click Reset to confirm this action and complete Search.myway.com removal. Here, select Extensions and look for Search.myway.com or other suspicious entries. Click on the Uninstall button to get rid each of them. Here, look at the Homepage field. If it was altered by Search.myway.com, remove unwanted link and enter the one that you want to use for your searches. Remember to include the "http://" before typing in the address of the page. Now you will see a detailed dialog window filled with reset options. All of those options are usually checked, but you can specify which of them you want to reset. Click the Reset button to complete Search.myway.com removal process. ^ IAC's Mindspark Acquires Apalon. Cision. Press release disitribution, targeting, monitoring . 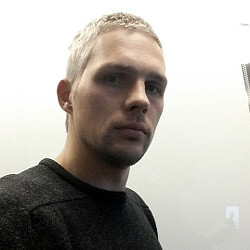 ^ Pieter Arntz . Mindspark toolbars. MalwarebytesLabs.The Security Blog from Malwarebytes. ^ Eliminate computer threats. Senzavirus. Cyber security news and malware elimination instructions in Italian. ¿Cómo eliminar El virus Search.myway.com? This entry was posted on 2019-04-01 at 02:47 and is filed under System tools, Viruses. You can quickly scan the QR code with your mobile device and have Search.myway.com virus manual removal instructions right in your pocket. How did you remove Search.myway.com virus?